We are going through a desperately sad time. Please see our News page for more details. Please be aware we are dealing with unusually high demand and some leadtimes are longer than normal. Feel free to e-mail us to check likely timescales. Please bear in mind that we are a manufacturer and not simply a shop. More Product Info and Customer Reviews: Click a product's 'Detailed Info' button to see more information/larger photos, related products, and to see customer reviews and to submit your own reviews. Optionally, create yourself an account and benefit from an order history, wish list and saved details. *New* Printed 2019 calendar sold in aid of our Alvecote Wood conservation site, composed entirely of photographs taken by Sarah, co-founder of Pragmasis, who very sadly passed away in April 2018. This is a true-A3 size printed calendar with wire binding across the top, in 'portrait' orientation. Click for a low-resolution PDF version of the whole calendar and the extra information provided via a sticker attached to the back cover (Acrobat Reader required). Postage/shipping is charged at or below our cost price. If you order 2 or more calendars, I'd recommend choosing the courier delivery service if the extra cost is not too much of a problem. More than 2 calendars, then the weight means it becomes cheaper by courier anyway. This calendar is also available for purchase and personal collection at the public Open Day events that we run at the woodland site itself. Collection from the woods avoids a £1-plus-postage additional cost. I.e. the price for personal collection from the woods is £8.00 inc VAT. Note: When sent through the post, a single calendar is rolled up in a specially-made 100mm diameter postal tube so it will _not_ fit through a normal letterbox. Delivery by Royal Mail is the cheapest for 1 or 2 calendars and it will not require a signature but your local postman will doubtless prefer someone to be available to accept the delivery, or will otherwise probably leave it in a porch, if you have one. You can choose courier delivery if you prefer, but that is more expensive and would then normally need a signature. 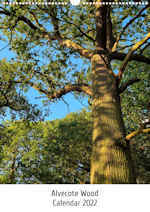 There is much more information about our conservation work on the Alvecote Wood website and Facebook page. Feel free to also order security products from the range we manufacture :-) Orders over £250 attract free courier shipping within the UK.